Limited Production Items – Stones, and Tokens, and Hearts, Oh My! Resiliency. $3.50/each on our website. Nothing in the world can take the place of persistence. Talent will not; nothing is more common than unsuccessful men with talent. Genius will not; unrewarded genius is almost a proverb. Education will not; the world is full of educated derelicts. Persistence and determination alone will bring success. This word has made it’s way into the news as of late – the wonders of social media picking up on comments made by a male senator about a female senator during a senate confirmation debate. ‘She was warned. She was given an explanation. Nevertheless, she persisted.’ These words have become a bit of a battle cry in today’s political climate, and can now be found on t-shirts, mugs, protest signs, and now…river rocks. In making decisions about themes and types of things we’ll carry, one of our goals is to not be particularly trendy or flash-in-the-pan. Too, we like to remain apolitical. While it’s important that we continue to add freshness and newness to our lines, we like to keep a baseline of solid, meaningful, consistent and non-controversial inspirational gifts. We’ve been selling most of our products continually for over 10 years. But, we do offer custom designs, so it’s inevitable that we get requests from our customers for the newest catch phrase or the latest and greatest trend. The ‘She Persisted’ rock design caught my attention a bit more so than others, because not only is it current news, it’s a theme in my personal and business life. Even when business is down, we persist. When we’re not feeling particularly inspired, we persist. When we have a difficult customer, or frustrating vendor, we persist. To be successful in business, we must persist. I love that we can rely on our customers to bring us inspiration. 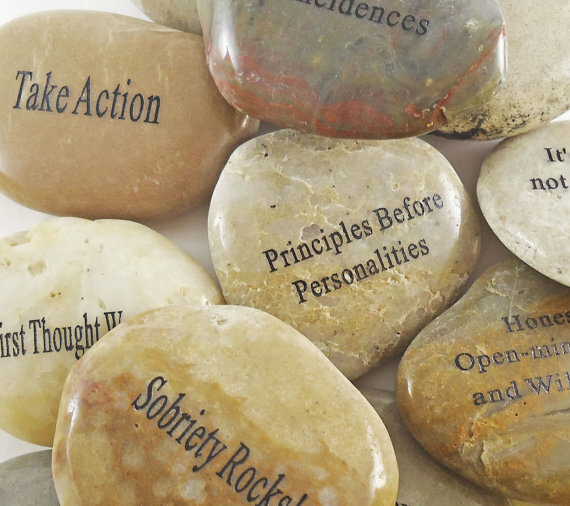 The Custom Designed River Rocks are one of my most favorite items because it’s so fun to see what customers come up with. And, we have fun conversations trying to guess what they are using them for. If someone were to describe me, I wouldn’t mind them using this phrase. I hope you find inspiration in it, too. Need to let someone know they’ve done a fantastic job? Tell them they are awesome with this limited production engraved river rock. YOU ROCK! Visit our ETSY shop for details and to purchase. Limited production recovery stones. Available in our Etsy shop only.